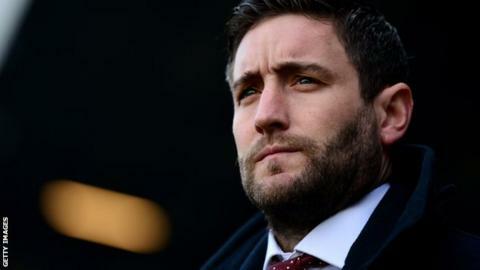 Bristol City head coach Lee Johnson has warned his players they need to improve at the same "rapid pace" as the club. Johnson's side are nine points clear of the Championship relegation zone with three matches remaining but slipped to 21st with Tuesday's 3-2 loss to Derby. "You can't make two or three errors on the spin, eight or nine times per half," Johnson told BBC Radio Bristol. "We're moving forward at a rapid pace so you'd better make sure you keep up with us, to continue your career here." City had led at the break against fifth-placed Derby but two goals in five second-half minutes won the game for the visitors. "I'm disappointed with the result and angry with the performance. It was very naive," he continued. "The lads worked their socks off but, against a good side, you don't get as much time on the ball as we were looking for. "It wasn't an attitude thing - it was a quality thing. We sort of ran out of ideas. "When they fall short of their own standards, it upsets me. "Because I love them so much, sometimes I don't know whether to give them a slap or a cuddle. "We tried to play - albeit not very well. We have to keep improving." The Robins, who won promotion from League One last season, were 22nd with just 25 points before Johnson's appointment in February and have almost doubled their points tally since then.